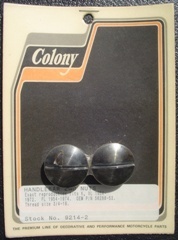 Exact reproduction of handlebar end nuts used on 1954-1974 Harley Davidson. Thread pitch is 3/4" X 16. Fits K, XL 1954-72, FL 1954-74 and FX, FXE 1971 - 1973.